Richard Artschwager, blps, 1968–2004. Installation view, Institute of Contemporary Art, Philadelphia, 2004. “MAKE A SILHOUETTE, BUT FILL THE INSIDE, which is nominally empty, with something—something that should be as nothing as black, but something,” says Richard Artschwager of the blps he’s been making since the ’60s. 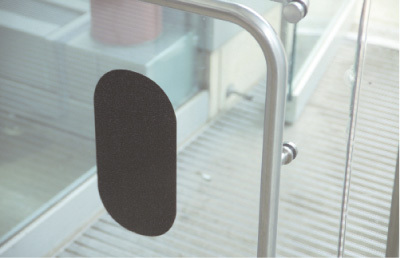 Intermittently stuck on peripheral wall space at Philadelphia’s ICA, these black lozenge shapes—here, made of vinyl—succeeded in conjuring something out of nothing: Unobtrusive bordering on nonexistent, they punctuated the gallery architecture, highlighting the institutional infrastructure that confers artistic status on otherwise meaningless objects. “The Big Nothing,” curated by the ICA’s own Ingrid Schaffner, Bennett Simpson, and Tanya Leighton, presented an expansive survey of similar gestures by over sixty artists that intriguingly demonstrated the extraordinary resource that “nothing” has been for contemporary art over the last few decades.